Bake a sheet cake the size you will need. 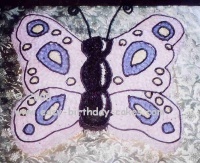 With a bag of icing and round tip #5 draw the outline of the buterfly on the cake. Cut away the cake outside of the outline so you are left with the butterfly's shape. butterfly themed cake to share? Click here to share your butterfly theme cake! In the picture above, pink, blue and yellow icing was used for the butterfly's wings, but you can use whatever colors you would like. Fill in the spots first using the color icing of your choice and a star tip #18 (which is the size used to fill in the rest of the cake). Next fill in the wings with the icing color of your choice. The body is done in chocolate icing. Do the highlights on the body in white icing according to the picture. Outline the wings in chocolate icing and round tip size #5 using the picture again as your guide. The antennas are made from black pipe cleaners shaped and stuck into the head. Here is a really colorful and pretty "Butterfly 21"" Pinata" that would match a butterfly theme perfectly. Also, these Butterfly Garden Candy Wrappers go perfectly with this cake and you can personalize them however you want to make them a special favor to pass out to all the guests at your birthday party. If you have made a butterfly cake that you would like to share, please submit your cake here and let us know how you made it! We would love to feature your cake on our site. Please make sure to include a photo of your cake and a description of how you made it, so that we can all share ideas and learn from each other! See Butterfly Cakes That Were Submitted By Others To This Site!